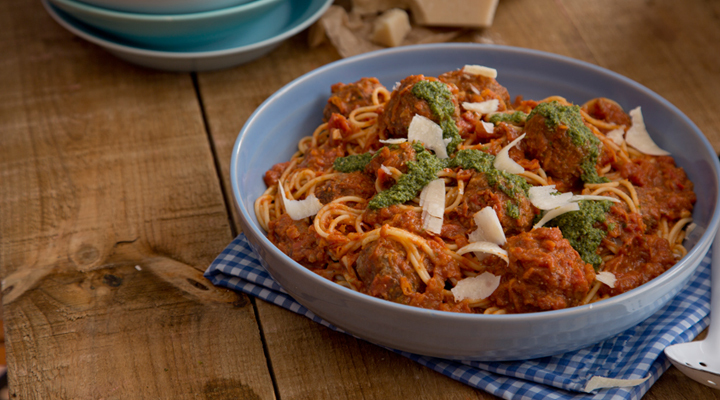 Add grated vegetables to the meatballs to increase your child's vegetable intake without them knowing! Place the minced beef in a bowl with half of the chopped onion and the egg, parsley, chilli flakes and some salt and pepper. Using your hands, mix together until well combined. Break off portions and roll into meatballs between the palms of your hands, then set aside on a plate. Warm the oil in a large ovenproof pan set over a medium heat. Add the remaining onion and the chopped carrots and garlic. Sauté for 2 to 3 minutes, then remove the vegetables with a slotted spoon to a side dish. Add the meatballs to the same pan and cook over a medium heat for 3 to 4 minutes. Return the vegetables to the pan, then add the passata and beef stock. Bring to a simmer, then stir in half of the pesto. Transfer to the oven and cook for 20 to 25 minutes, until the meatballs are cooked through. Meanwhile, bring a large pan of salted water to the boil. Add the spaghetti and cook according to the packet instructions, until al dente. Drain well. When the meatballs are done, remove the pan from the oven and check the seasoning. Drop the pasta on top of the meatballs and stir to coat it in the sauce, then drizzle the rest of the pesto over. Sprinkle with the freshly grate parmesan cheese and serve immediately. If you're watching your calorie, fat or salt intake, try reducing the amount of pesto or leaving it out altogether.